Key Lime Pound Cake - Chocolate Chocolate and More! So who gets all green for St. Patty’s Day? Honestly, I’m really not that into the holiday. When we were kids it was fun to go around pinching people who forgot to wear green but otherwise…it’s just another day. There is a big bonus to the holiday and that the food. I love any excuse to eat special food, especially sweets so I was all in when Jen from Jen’s Favorite Cookies invited me to participate in a St. Patty’s post. We have this little cupcake bakery here in town. They make the most unbelievable Key Lime Cupcakes. I’d eat them by the dozen if I could afford to. Sadly, the bakery has overhead, blah, blah, blah and one cupcake is about $2.50. Two cupcakes for $5.00, sorry, no way. And they’re tiny. The cake part doesn’t even fill up the paper wrapper. I’m glad they’re doing well, I do try to support local, I’m just not going to shell out the bucks for something I can make myself. I’m still trying to replicate their cupcakes but I did come up with this fantastic Pound Cake. The flavor is almost identical to those sweet little cupcakes. The cake is just denser, definitely a pound cake. I even found real Key Lime Juice at the store so I didn’t have to squeeze harm any Key Limes in the making of this cake. 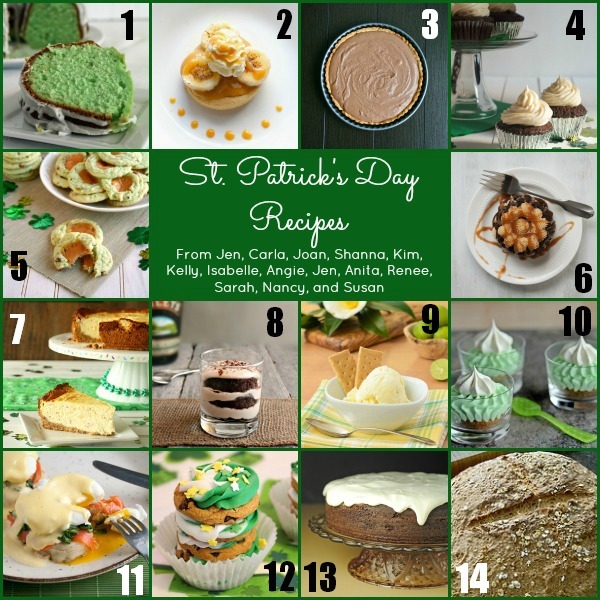 Be sure to check out all the other wonderful recipes my friends have made for St. Patty’s. Preheat oven to 350 degrees. Place rack in lowest position. Grease and flour a bundt pan or 2 loaf pans. In small bowl, combine buttermilk and lime juice, set aside. Cream butter and sugar until fluffy. Add in eggs one at a time, beating well to fully combine. Combine flour, salt, baking soda and powder in separate bowl, stir to combine. Add flour and buttermilk mixtures to butter mixture, alternating, starting and ending with flour. Do not overmix. Add in food coloring, stir just to combine. Spoon batter into prepared pan(s). Bake for 50-60 minutes, testing with a toothpick for doneness. Remove from oven and let rest in pan for 15 minutes before inverting onto cooling rack to cool completely. Prepare glaze by combining powdered sugar and lime juice to a thick pouring consistency. Drizzle over cooled cake. Let cake set for 30 minutes before serving. I feel the same as you, those cupcake shops charge a lot for a little cupcake and you can make something even better at home. Your cake is such a pretty green color. It has me looking forward to St. Pat’s and spring even more. ha! I love your comment about harming any key limes 😉 There’s a few cupcake places here in Philly that make delicious cupcakes, but most of them are $4/cupcake! Granted, some of them have fancy flavors, but I feel like I’m paying for a ton of frosting and I don’t even like a lot on my cupcakes to begin with! /endrant. Anyway, this is a gorgeous poundcake and I’m sure it would also translate beautifully to cupcakes! Happy St. Patrick’s Day! Most cupcake places around us are at least $4 a cupcake too. Insane amount for one cupcake that I can make at home too!!! This is such a fun cake! I love how bright green it is!!! I’m glad no key limes were harmed in the making of this cake! I’m with Jen, I love pound cake, this looks really delicious. It looks great! I love lime flavored desserts, so I’ll sure love this one! oo I love Key Lime Flavor! this looks and sounds wonderful! Key Lime is one of my favorites, too! 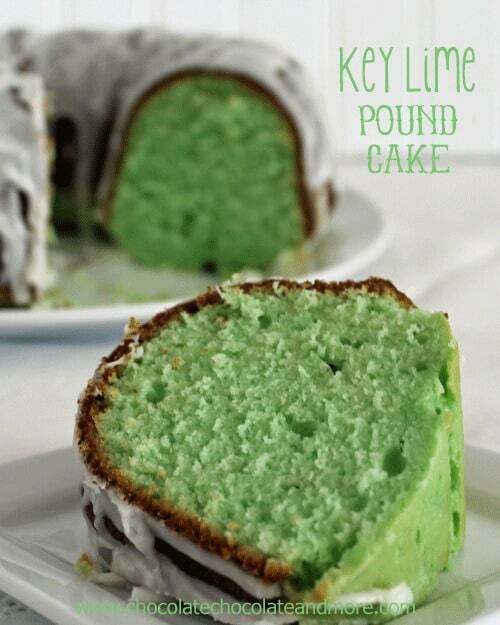 Yum, key lime pound cake sounds absolutely delicious! Joan, I hear ya, girl. I never buy cupcakes because they’re always overpriced and they have more sugar laden frosting than the cake portion. I’d much rather bake them myself! Good luck on replicating the cupcake. In the meantime, this pound cake looks divine! I loooooove pound cake and this looks perfectly moist, dense and flavourful. Not to mention that amazing green colour – so festive! I know, $5 dollars for a cupcake? Pu-lease. They cost like 60cents each to make. This is a PERFECT st. patty’s day treat! Yum! This is spectacular lady. 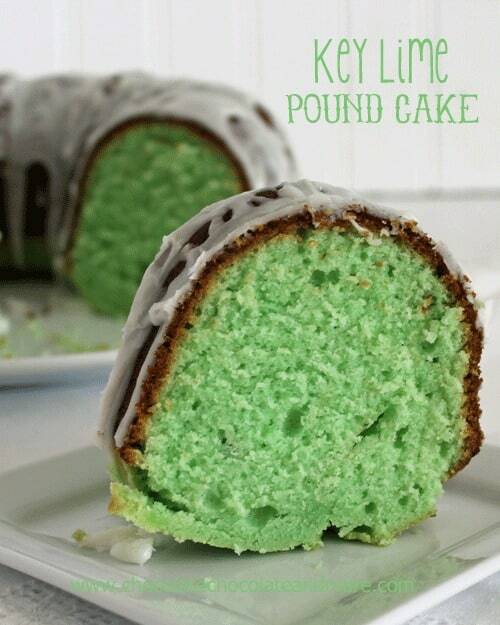 I love a good pound cake and key lime is perfect for St Patty’s Day. Green is good. Bring on the green. I swear I’m a sucker for the tiny little cupcakes with coloured sprinkles at the grocery store. I don’t know why but I occasionally indulge. It’s hard to say no. Now Starbucks, whole different story. I once paid $6 for a cupcake and it wasn’t that good. This is perfect for St. Patty’s! I love the key lime! I love key lime and this looks amazing! Just delicious looking and the color is great! I’m pinning to Bundt-O-Rama! I’ve never really been into this holiday because I’m not much of a drinker. But I love the food people come up with! This looks great. Forget St. Patrick’s Day, I could go for this pound cake any time and I did just spy key limes at Whole Foods! I totally agree with the whole “Not gonna pay that much when I can make a cupcake just as good” philosophy. One, OK. Because I like to support local, too. This is pretty amazing-looking pound cake! This looks delicious! I love citrus desserts. Definitely going to have to pin and try to make. What a colorful cake! Love key lime flavor. Aha, I love pound cake!!! Key lime is a new twist! 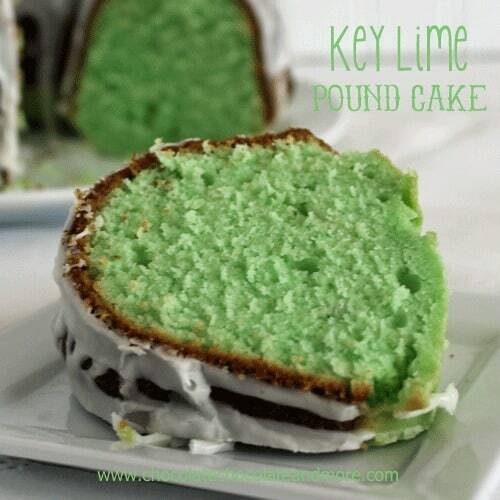 Will definitely try this…I happen to like BOTH key lime and pound cakes! Together, they work in perfect harmony! wow perfect for st pattys day!! love all the green food around these days! $2.50 a cupcake? Then come here, you won’t get one for less than $3.50 maybe even $4. This cake sounds so refreshing. makes me dream of summer days even more! Gorgeous cake, the color is so intense! Makes it so perfect for ST Patty’s day for sure. Nice recipe! Very yummy! I lived in the Florida Keys for a year and a half. I hated living there, but I LOVED all things key lime. I’m pinning this to make during annual vacation there. Thanks for sharing! I love the color of this pound cake and the flavor–it must be as beautifully bright as its color. Love it! This looks pretty and I am sure it tastes awesome too ! I love key lime….!! Love, love key lime! Adding it to a pound cake is genius! Ok, I made this wonderful looking cake yesterday and sadly it is very dry and not much flavor except for the frosting. Was there supposed to be a little oil in it or something? It looked beautiful and smelled really good while it was baking. I followed the recipe to the T. Any suggestions? I’m falling in love with Key Lime. Pinned! Thanks so much for linking up to Two Cup Tuesday at Pint Sized Baker. I look forward to coming back on Monday Night! I L-O-V-E pound cake! This sounds delicious! Love that color! Looks so delicious makes me want a bite right now 🙂 Pinned Joan! Thanks for sharing at Mom On Timouout! I made this cake yesterday, the only change I made was to add 2 teaspoons of key lime extract and lime zest to both the cake and icing. Added no food coloring. It is WONDERFUL!!! i’m all about key lime these days! sounds delish. Is there a substitute for key lime juice? I haven’t been able to find it. Just use regular lime juice, no one should be able to tell the difference. This cake looks soooo good, I’m going to bake this one for sure, the recipe sounds great. Thank you. Thanks Peggy, I hope you enjoy it! Loved this recipe! I omitted the green food coloring though. Shared your link on my blog http://www.joyfulscribblings.com/2013/07/key-lime-love/ . Thanks for sharing! I was wondering where you buy key lime juice? I can find lime juice but not key lime. I found mine at Publix. if I don’t use any food coloring will it still be green at all.? No, without the food coloring this cake would look more like a vanilla pound cake as the lime juice is almost colorless. I made this recipe yesterday (two loaf pans) and went full color for St. Patrick’s! Instead of the glaze, I made an agave whipped cream and hubby loved it. I’m from a little GA town. Where are you from? LOVE the Key Lime recipe! I’m sorry it didn’t turn out as you’d hoped. Cakes usually dry out when over baked. Maybe reduce the baking time by 5-10 minutes. Can you tell me which store you found the key lime juice in, and which section of the store? Thanks! I’ve found the Key Lime juice in both Walmart and Kroger. It’s usually right by the lemon juice. I made this at my wife’s behest, and it is pretty fantastic. I skipped the food coloring though. Gracias! Glad you enjoyed it. Food coloring should always be optional. I’ve never heard of lime crystals but if it’s adding the lime flavor it should work just fine in place of the lime juice. You will want to add some water (the amount of the lime juice called for) to keep the right consistency of the batter. I have a recipe for apricot nectar pound cake but the inside is neon green and it is fantastic. My kids when they were in 4h and much younger, entered it with the new name ‘NEON POUND CAKE’. Needless to say the judges were in for a surprise when they cut into the pound cake. The flavor is delicious but I used green lime jello…..dry…..added to my cake mix and it is out of this world. If you wanted to sub the dry jello for the food coloring it might give that added lime flavor too. ***Note any dry jello can be added to a pound cake or cupcakes to get your desired color. Strawberry, orange, lemon, cherry, black berry, and others….but they all come out almost being NEON….they are beautiful. Just a suggestion…but your cake looks delicious and I am going to try it. Can someone please help me make this GF, egg free and dairy free?